Dumping refer to the act of exporting goods by a country to another at a price below its cost of production. Anti-dumping is the penalty imposed on low-priced imported goods to give local products fair chance to compete against the suspiciously low-priced imports (Kochher, 2009). Theoretically, dumping was set to give fair chance to the local product and local producers, however, an anti-dumping started between China and India and affected many other countries. Each country is imposing the anti-dumping penalties as a retaliation to the same act done by the other. Anti-dumping spread from 35 to 96 countries between 1980 and 2003 (Vandenbussche & Zanardi, 2008). World Trade Organization (WTO) should revise its anti-dumping rules to prevent some countries for misusing the anti-dumping rules. The Foreign Direct Investment (FDI) was affected by anti-dumping misused in China but Dang, Feng, & Lv (2010) stated that multinational corporations’ FDI will not be affected if China select to impose fair anti-dumping measures. Dang, J., Feng, Z., & Lv, H. (2010). The effects of antidumping measures on the FDI: A pre-marketing behavior aspect analysis in China. [Article]. International Journal of Organizational Innovation, 2(3), 206-224. Kochher, P. (2009). India and china antidumping wars: Who is the winner? Globsyn Management Journal, 3(2), 61-64. Trade policy is a set of standards, rules and regulations that govern the country’s trade. A good trade policy would maintain or improve the country’s trade by regulating the tax, tariffs and inspections regulations. Countries would look for a set of trading standard or regulations to smooth out the trading between both of them. A strategic trade policy would affect the firms strategic interactions in international oligopoly (Sen, 2005). A business can push for a trade policy that give it more advantage of over the international competitors. For example, if two producers of the same product are competing in the local market but one of them is national producer, the national producers should ask for tax or tariff put on the international producer to give it the price advantage in the local market. The U.S. entered in three free trade agreements. The second agreement was with Canada and the third was the North American Free Trade Agreement which is known as NAPTA (Taylor, 2009). The three agreements were set as a result of the U.S. experience in the globalization and multilateral system. Free trade agreement would be the best agreement the business may bush for because it lefts taxes, tariffs and quotas. Globalization would be faster and more effective between countries who agree on the free trade because the products can have fair opportunities in participating countries and the best product would be available to the consumer at the lowest price. Taylor, C. O. N. (2009). Of free trade agreements and models. Indiana International & Comparative Law Review, 19(3), 569-609. Comparable study was conducted by Forster, Loughran, and McDonald (2009) on a sample of firms listed on the Standard & Poor’s 500 showed similar sentences in their code of ethics. The repeated phrases are covering law obedience, acting with integrity, commitment to integrity, commitments to treating others with fairness, exercising citizenship rights and remaining committed to the organization’s values. Messikomer and Cirka (2010) stated honesty, respect, integrity, quality, neutrality and responsibility as the code of ethics principles for the organization (Messikomer & Cirka, 2010). The list of important rules and principles above are a good guideline to write most of the organizational code of conduct. The process can start with identifying the organizational values and learn for the past experiences when the organizations had ethical problems or when employees violated the organizational values. The employees should be involved in writing the code of conduct, however representatives from each departments or sections would be enough when the organization has many employees that could not be assembled in one locations to discuss such intangible issue. The key stakeholders comments would be valuable for writing the code of ethics because the stakeholders are directly affected by the organizational ethics. 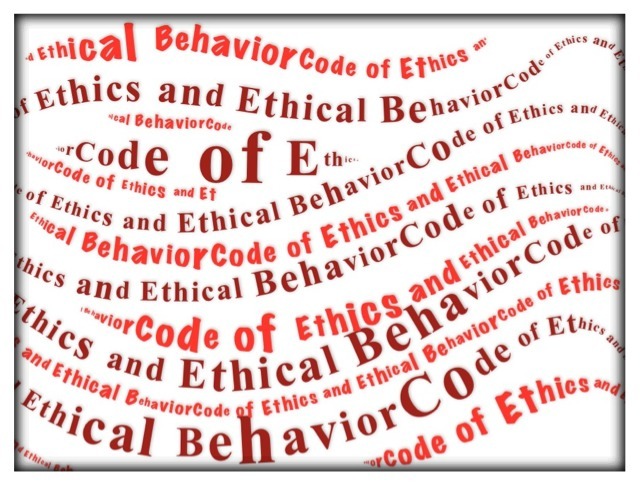 The code of ethics history shows that the code writing was reactive to the international ethical violations (Messikomer & Cirka, 2010). Foreign Corrupt Practices Act (FCPA) of 1977 was set to control the supply side corruption by imposing anti-bribery provisions and accounting provision. The act had limited success in the anti-bribery practices according to Darrough (2010), but the ethical users relatively subsided after issuing the act (Messikomer & Cirka, 2010). Russia has many natural resources with oil and gas are at the top of the list (Ledyaeva, 2009). Most of the goods produced in Russia would be approximately close to European market. Ledyaeva (2009) warns that the legislation and political risk in Russia had increased since 1998. Geinberg (2008) explain that Russia had good natural resource that made the Russian government accumulate enough cash to invest in the available opportunities. Foreign investors are shying away from Russia because of the their growing concern that their investments could be seized by the government (Grinberg, 2008). Czech Republic would be a better place for your investment because of its association with the EU. Czech Republic would had lower labor cost and is open for trade but need the capital investment (Janicki & Wunnava, 2004). Kraftova (2005) state that the most promising countries for investment that joined the European Union is the Czech Republic. The rate of youth in the age of 20-24 with secondary education is high, the employment of women is more than 50%. The Czech Republic would need to increase its labor productivity because it has productivity lower by %40 than the EU countries (Kraftová, 2005). The Czech Republic need to spend more on the research and development because its research and development effort is lagging behind the EU countries (Kraftová, 2005). New opportunities would be discovered during the research and development work which will benefit. The local governments workforce life time education for the people in the age between 25-64 is lower than EU countries because Czech has %6.3 when EU had %9.5. Czech Republic is part of the EU which is a complex and creative cooperative system of 25 different cultures. This mix would consider the Czech Republic as a potential site for investment if the above points were mitigated (Kraftová, 2005). Grinberg, M. (2008). Oil and power politics. Risk Management (00355593), 57-57. Kraftová, I. (2005). Investing in the Czech Republic. Journal of Corporate Accounting & Finance (Wiley), 16(6), 39-45. The foreign corrupt practices act (FCPA) is as an anti-bribery regulation. The act is prohibiting direct and indirect valuables (monetary or physical) offering to foreign officials to influence their decisions in favor of the giver. The act has consist of two parts to control the international corruption, the first would be an anti-bribery provision and the second is books and records internal controls that enforce a good accounting provisions (Darrough, 2010). International corruption prevention is difficult and a single act like FCPA would only result in limited success if not fully embraced by the international organizations and the countries these organizations work in. the bookkeeping, disclosure and maintenance of internal controls systems are effective measures to prevent unlawful acts by the multinational organizations according to Darrough (2010), but the so-called “facilitating payments” are allowed by the act and these payments can be considered as another form of bribery. U. S. Companies would be would be disadvantaged by this act if they chose to implement it without any deviations. Bribes and “facilitating payments” were common before the act and were practiced by the U. S. companies and other international companies. The U. S. Companies should act ethically (before acting legally) and withhold these payments, but foreign officials would most probably be influenced by the bribes they received from non U. S. companies (or U. S. companies that chose to pay facilitating payments). Some of us would like to start a new business or expand their business to new geographical location. The new business owner would think of most of the business related issues but forget the soft and intangible issues like ethics and culture. Three thousand managers and employees were surveyed in the U. S., stated that ethics compliance did not change as expected after implementing ethics compliance programs (Gebler, 2006). Organizational culture had more influence on ethics programs success than any other factors (Gebler, 2006). Managers who aim for ethical culture change and target long-lasting Corporate Social Responsibility (CSR) are facing difficulty in showing the benefits of such programs to the shareholders (Grossman, 2005). The shareholders would like to see immediate results to prove the managers spending (Grossman, 2005). The basic components for ethical decision-making are moral issues, recognition, making moral judgment and engaging in moral behavior (Ingram, Skinner, & Taylor, 2005). These components would help in setting up an ethical international operation that account for cultural, religious, national, gender, and racial differences. We need to study the local culture and religion and how it will be affected by the new business. If the business is established in the international market then we need to assess the effect of the existing business form the environmental, religious and cultural aspects and make sure their compliance to the findings. Deviating from the ethical standard would lead to social and economical conflict with the locals. The result would be assessed for risk before taking the action to avoid legal actions. Deviations are allowed when the deviations benefits can outweigh the losses from the ethical operation. Gebler, D. (2006). Creating an ethical culture. Strategic Finance, 87(11), 28-34. Grossman, H. A. (2005). Refining the role of the corporation: the impact of corporate social responsibility on shareholder primacy theory. [Article]. Deakin Law Review, 10(2), 572-596. OK, this is might be my third post about my love of coffee, but again who does not love a good cup of coffee with that delicious taste and wonderful aroma. I was visiting Kingdom of Bahrain and was walking in one of the many modern malls when I stopped for a cup of coffee. I was looking for the usual international coffee shop brand but I could not located. I think the caffeine urge had overcome the coffee search so I stopped at this coffee shop. It is called “Caffe Vergnano 1882” and I would assume that this brand of cafe is operational since 1882 as the number suggest in the name of the cafe. So I got the menu and kept it aside because I knew what I needed. 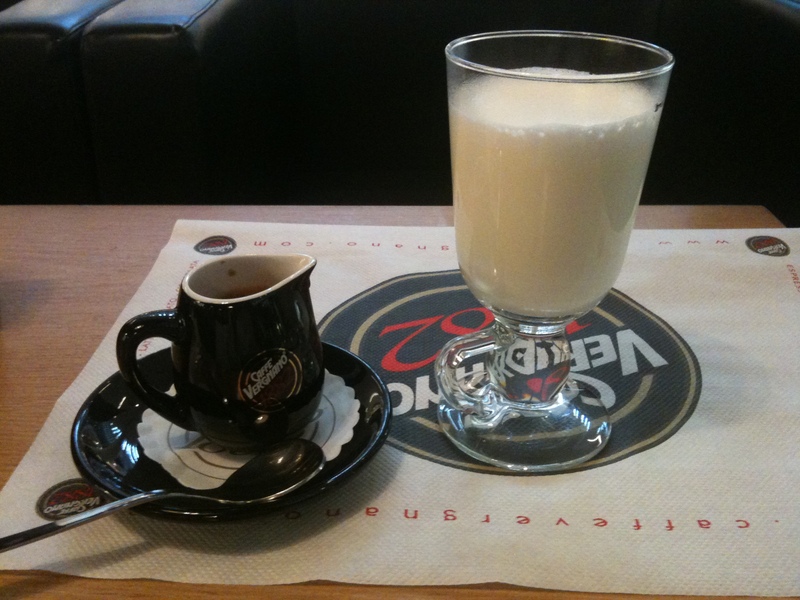 So I asked for my latte and I got this unusual set of hot milk and espresso. I thought of drinking the espresso first then the coffee but then I noticed the big spoon. Which meant that I should mix the coffee with the milk and the seer it up. So, the taste was ….. sensational, unbelievable and much better than what I used to drink at Star…ks (you know the name). I think I will be a regular customer to this cafe whenever I am in Bahrain and would look it up in every country I visit. Does Your Goals Match Your Organization’s Goals? 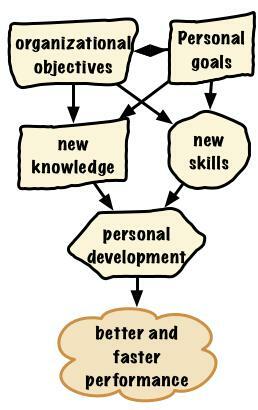 Many employees work very hard to achieve their personal goals thinking that these goals would help them to excel in the their careers. Sometimes, personal and career goals are a perfect match because the individual had planned it that way. We all have needs and wants that appeal to us. We would like to achieve them but they do not help us to climb that steep professional ladder to reach the desired promotion or salary increase. Reading the following pages would help identifying your personal strength and weakness and guiding in converting the weakness to a strength to reach your challenging goals. The last page would help the reader to compare his or her personal goals with their organizational goals. The reader is asked to match his or her goals with the career goals and try to aim for a common goal that develop him or her and to achieve the organization’s objectives. Many employees work very hard to meet their personal goals thinking that these goals would help them to excel in the their careers. Sometimes,personal and career goals are a perfect match because the person had planned it that way. We all have needs and wants that appeal to us. We would like to achieve them but they do not help us to climb that steep professional ladder to reach the desired promotion or salary increase. Reading the attached pages (by clicking here) would help identifying your personal strength and weakness and guiding converting the weakness to a strength to reach your challenging goals. In the past two weeks I had to experience few days without the invisible wireless service of the internet. One of the reasons was my personal vacation and I wanted to stay away from my daily routine, the 24 hours connectivity and the virtual social network. I tried to stay away from the internet but could not. Many of us are addictive to the internet. Most of us use the internet for work and professional uses but we socialize from time to time on the Internet even during the working hours just to break out from the stressful work environment. During my stay in the hotels I had to pay the expensive and unrealistic internet fees just to stay connected. What I paid for few days in the hotel is enough to get me connected on a high-speed internet at home for a month, but again I am addicted to the Internet. The second reason I need the internet is to continue my commitment to the readers of this blog. I maintained my “three posts per week” through my most difficult times and tried to make up for the days I missed if that rarely happened. The third reason I need the Internet is my daily access to the digital libraries for my researches. I usually use this third reason to justify my need for the Internet but actually I need the Internet for the other reasons also. I have internet service on my mobile phone, on my iPad and I got wireless serves at home and at work just to stay connected all the time. I do not know about you, but I am hooked on the Internet. Like you, I have traveled a lot and visited different countries. Dying my travel I try to select the best hotel I can offered. Most of us select the best hotels for security and safety reasons then look for comfort and services. he following is my personal guideline to distinguish the good hotels from the bad ones. 10 Food come pushed into the room on a nice table. Hot food is in small hot box under the table. The food is carried in a tray and placed on your bed. 8 The room has a table and a chair that can be used as a small office for you to work from. You will be lucky if you have a chair in the room. 6 Good quality paper tissue boxes are available in the bathroom and next to the bed. One box of cheep paper tissue box is available in the bathroom. The box is usually have 3-10 tissues only. 5 The shower water is cold and hot with sufficient pressure to massage your nick and back. Shower drainage is open to take all the water you can shower with. Shower water is in room temperate with pressure enough to push the water our of the shower head. Water level is building up on your feed while you are showering. 4 When you ask for direction in the hotel, the person will ask you to follow him/her until you reach the place you wanted. You will be lucky to find somebody to point his/her finger in the approximate direction of what you ask for. 3 White clean towels in different sizes are hanging in the bathroom at you arm reach On big (and sometimes another small one) is available and you are doubting if you should use the. 2 You have a quite room to sleep or work with a beautiful view from the big window. You laugh at you neighbor’s noise in the bathroom, and then you wonder if he/she is laughing at you also? 1 You need to mention the hotel name to the taxi driver and he will smile and start driving. When you mention the hotel name, the taxi driver will ask you to get out of the taxi!